Success in the playoffs comes down to matchups. Unfortunately for the Pittsburgh Penguins, their ‘reward’ for finishing with the second most points in franchise history (108) is a first round date with the Philadelphia Flyers, the one team that has managed to consistently frustrate them this season. The Penguins and Flyers face off in Game 1 on Wednesday (click here for a full schedule and TV listings) and both teams will be looking to set the tone early. One aspect of the game that becomes important in a playoff series is line matching. Do both coaches try to outwit each other? Does the strategy change at home when a coach has the advantage of last change? The challenge for Peter Laviolette and the Flyers will be prioritizing the Penguins’ threats. Pittsburgh’s trio at the center position of Sidney Crosby, Evgeni Malkin, and Jordan Staal is something no team in the NHL can match head to head. 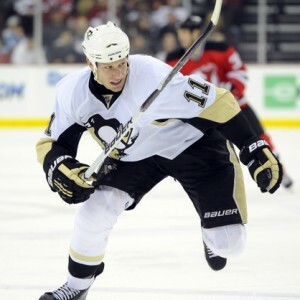 It remains to be seen how much effort Bylsma will put into matching lines at home in Games 1 and 2. It’s probably in the Penguins’ best interest to have Staal’s checking line and the shutdown defensive pair of Brooks Orpik and Zbynek Michalek matched up against Claude Giroux’s unit. After that, Bylsma is better off rolling his lines freely and forcing the Flyers to come up with a way to stop Malkin and Crosby. Keeping Giroux’s line away from Staal will help the Flyers from an offensive perspective, while the mobility of Carle and Timonen is best suited to counter the blazing speed of Sullivan-Crosby-Dupuis. The risk in trying to overthink line matchups is it can become a distraction. Instead of getting into the flow of the game, coaches and players get fixated on countering the other team. Sometimes having less to think about is better in a pressure-packed playoff series. Laviolette’s stick-bashing and bench confrontation with the Penguins two weeks ago was curious, to say the least. Perhaps he felt a button needed to be pushed with his team heading into the playoffs. It’s also possible he let his emotions get the best of him. Flyers’ fans should hope the latter isn’t the case. The playoffs are an intense grind and the coaching staff and general manager need stay in control when the temperature starts to rise. It’s never wise to speculate about a team’s locker room dynamics — especially when you don’t cover them on a regular basis — but I did spend a few days around the Flyers and New York Rangers at the Winter Classic. The two teams couldn’t have been more different. The Rangers spoke repeatedly about discipline, accountability, and the enormous impact of veteran leaders Mike Rupp and Brad Richards, both of whom arrived in the offseason via free agency. There was a sense that this group was willing to skate through a brick wall to win a Stanley Cup and it showed in their regular season performance. Philadelphia was wrapped up in the Bryzgalov drama at the time. The $51 million goaltender was basking in the media spotlight as he struggled through an awful stretch on the ice. Instead of coming to the defense of their teammate, a few Flyers players suggested his struggles were well-deserved. Bryzgalov has turned his game around in recent months, but what will happen when he has to face the inevitable playoff adversity (he’s allowed 41 goals in 11 playoff games the last two years)? What will happen when the media runs to his locker to get his thoughts after allowing five goals? Last year, there were concerns that the leadership styles of captain Mike Richards and the outspoken Chris Pronger could not coexist in the same room. The Flyers traded Richards to Los Angeles in the offseason and Pronger is now likely facing retirement. Has anyone stepped up to take their place? The Flyers have as much depth and talent as any team in the NHL, but it just feels like they’re a house of cards waiting to collapse. With so much offseason turnover and a handful of rookies being relied upon for substantial contributions, can Laviolette guide his team through the challenging moments? It will be interesting to watch this team’s true identity reveal itself over the next few weeks. The Penguins will also need to find a way to show restraint. It’s no secret that the Flyers plan to punch, hook, hold, and irritate Crosby and Malkin at any opportunity to get them off their games. It’s easy to talk about emotional control days before the playoffs start. It’s more difficult to follow through on those plans once the action heats up. Crosby knows this will be the toughest challenge for he and his teammates against the Flyers. Fortunately, this Penguins group has a great deal of experience managing emotions and overcoming adversity. In their 2009 Stanley Cup run they were down 2-0 in the series against Washington and Detroit before coming back to win both. They’ve also developed a knack for coming back in games. Pittsburgh leads the NHL in winning percentage when trailing after two periods this season. Pittsburgh’s best chance of countering the Flyers gameplan is a potent powerplay though. The Penguins are still tied for fifth in the NHL with a 19.7% powerplay success rate, but they haven’t found chemistry as a unit since Crosby’s return. Two weeks ago, we broke down the strategies the Penguins have used in the new powerplay setup and they’ll need to find a way to execute in the first round. Hockey fans across the continent are in store for an Eastern Conference Finals caliber matchup in the first round. There’s a tremendous amount of hype heading into the Pittsburgh-Philadelphia series, but Crosby says it’s tough to predict what will happen until the puck drops at 7:30pm on Wednesday.